One of our focuses is on children and their success, in our Family School Connection program. So what better way than to partner with Our Piece of the Pie (OPP) and give high school students in the Hartford area some work experience this past summer. We welcomed 3 summer youth employees to three of our sites, Peter’s Retreat, MANNA Community Pantry and MANNA Community Meals. The students were placed according to their interest and worked for 5 to 6 weeks, learning the ins and outs of each site, getting to know the clients and learning what it meant to help those who need the services that HOH provides. Over all the students enjoyed working with HOH. Emily Kaas, Hands On Hartford’s Volunteer Coordinator, had the opportunity to meet with them every Friday to check in with them and to promote further community engagement and emphasize service learning, something that HOH prides itself on. The youth came up with a great idea one Friday to have a food drive for the Community Pantry. “It was great to see them identify the need they’ve been seeing through their work in our programs, and then come up with a plan themselves as to how they can help” said Emily Kaas. They were able to collect some food and be proud of what they accomplished not only from this food drive but throughout their time with Hands On Hartford. “It was so inspiring to watch these youth grow and mature in just a short few weeks. I had the opportunity to not only watch them do some pretty hard work at our programs, but also interact with our guests and clients in a genuine way. These three youth had the unique summer opportunity to grow their connections within Hartford, and so did Hands On Hartford,” Emily adds. What do you get when you combine 12 high school students with a voracious appetite for service? The answer is a week of meaningful mission work and service learning throughout the Hartford community. The youth group of the First Congregational Church of Vernon spent a summer week during the month of July engaging in an array of service – no job was too big or small. Hands On Hartford coordinated projects for 3 of their 5 days of service and placed the youth at Peter’s Retreat, Community Meals and at our community partner Salvation Army Marshall House. On the morni ng of July 24th, the 12 youth and their chaperones spent the day accomplishing myriad projects at our soup kitchen. They deep cleaned tables & chairs, the kitchen, and prep room. They brought prizes and orchestrated a game of Bingo for our clients. The team tackled organizing the canned food in the prep room – which was desperately in need of an overhaul. They also brought all of the fixings and prepared ice-cream sundaes and salad to complement the meal. During the reflection, led by volunteer coordinator Emily Kaas, Ryan shared that his favorite part of the day was “seeing everyone get so excited for the meal. It was great knowing that we had a hand in making that happen.” Many of the youth concurred that the experience humbled them and made them more appreciative of their own home, family and life situation. The group arrived with white paint and sleeves rolled up to paint resident’s doors on the afternoon of July 25th at Peter’s Retreat. They moved expeditiously and within a couple of hours had all of the doors on the first floor painted. They were even able to spend some quality time interacting with the residents; a significant portion of their reflection centered on HIV/AIDS education and their perceptions about the disease. The team wrapped up their week of service at Marshall House. They spent the day painting the future employment center a soothing blue hue. The room which is now barren, will be set-up with computers to allow residents to work on their resumes and apply for jobs. The room will play a pivotal role in allowing the residents to get back on their feet. They painted the walls, doors and trim and left the space transformed and inviting. 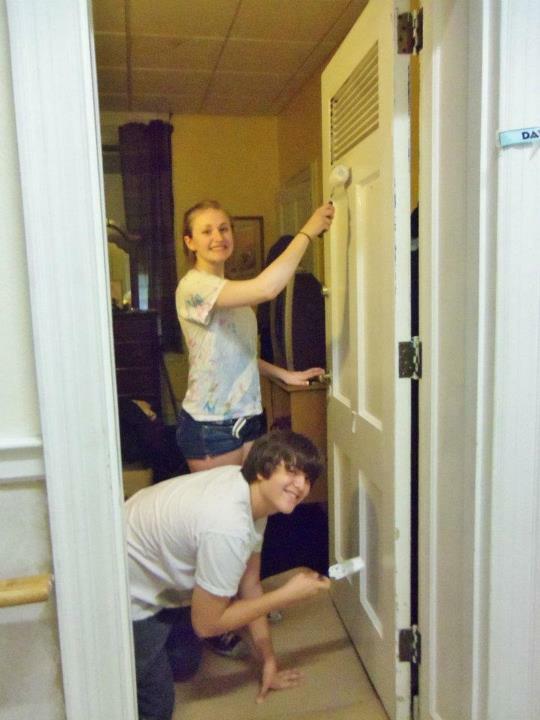 They also assisted with miscellaneous projects such as washing windows and moving furniture. At the end of this project, they concluded with a reflection that consisted of writing inspirational cards to residents and talked about their overall sentiments of Hartford both pre and post the mission work. The youth seemed to have a better impression of the city as a result of spending time there. They also gained a deeper understanding of those who live in the city in particular those who are homeless or living with HIV/AIDS. We truly appreciate having had the opportunity to work with such a fine group of youth who value service. Thanks for your time, talent, materials/supplies, open-mind and willingness to serve those in need First Congregational Church of Vernon.